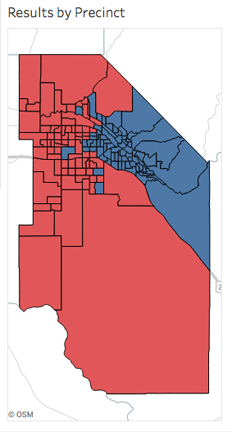 Like the American Civil War, Boise seems to exhibit a North-South split on most issues. This was the race for governor, but it was similar for most races. We noticed the Dem-Repub split not only on the race for Governor, but also on propositions, ACHD vehicle fee hike, and other county-wide races. The “north end” influence is nothing new, but to see such a distinct split north of the Boise River is fascinating. Think about it. Is it religion, schools, trees, income levels? How are like minded people grouped in such a tight geographical area? The GUARDIAN was glad to see the developers and contractors wasted their profits supporting the unfair vehicle fee hike which would have raised registration fees 70% while exempting those over 8,000 pounds. Now it is time for the legislature to come up with a law that will allow ACHD to tax ALL vehicles in a fair manner to fund the growth created by local governments. Unless there are some political appointments, Ada County Commishes Jim Tibbs and Dave Case have ended their political partnership after losing elections to women. Tibbs was ousted by Diana Lachiondo, a staffer in Mayor Dave Bieter’s office. She will be joined by Kendra Kenyon who beat Sharon Ullman. Ullman won over Case in the primary. One of the big items to face the new commissioners will be the fate of Les Boise Park at the fair grounds. Voters soundly defeated a measure to legalize “historical racing” slot-machine. If claims by supporters are true, horse racing is dead at Les Bois. Finally, the biggest winners in this huge election were the TV and radio stations. They made millions of dollars airing all the ads. Prop 2 is a success! That is a great win for Idaho! How did the votes for Prop. 1, 2 and the Ada County vehicle registration fee hike break down along precinct lines? Prop 1’s defeat, signals that equal treatment under the laws of our state is a now dead concept. And that politicians can decide who wins and who benefits in our State, and hand monopolistic benefits to privileged groups, for whatever self serving moralisms that drive their political views. Yes – I know some of the principal players in this. Horse racing was NEVER about making money. It never did. It was for the love of sport. Today – the tribes (who give NOTHING back) win; the community looses; equal treatment under our laws looses; horse racing looses; horse people loose; potentially – citizens who would have received any profits (had there been any) for scholarships etc, loose. Nice. It really is the BLUE Country of Ada. For the most part completely disconnected from the rest of Idaho. I suspect that the blue precincts shown on the map above have a population with a higher rate of public sector employment. As for a reason why they would collect in one area, maybe they like to live in an echo chamber (safe space) and not have their views challenged by neighbors. Or perhaps, a more mundane reason is that those areas are close to many government offices in downtown Boise. The reason it’s the blue country of Ada is mainly due to the fact that more of them vote. At least that’s the case in the past. I haven’t run the numbers this time. Prop 1 WAS about special interests getting a state sanctioned casino, and horse racing was the straw man. The campaign against the tribes had the shadow of racism. Their gaming is perfectly legit under federal law. And why shouldn’t the tribes want to protect their industry. Amend the Idaho Constitution to permit different forms of gaming. I really like the vibe in the North End. You can wander down the streets on the weekend and find open social gatherings everywhere. Lots of very nice, intelligent folks. Unfortunately, I wanted a large piece of land for under a million bucks, so ended up on the Bench. The Bench area seems to mainly consist of ignorant, angry, religious zealot Bible thumping alcoholics. FYI, I’m not a Democrat or a Republican. EDITOR NOTE–Perhaps we now know why this reader moved away from Boise. Am I a “north ender” at heart? I grew up on the Boise Bench – went to Monroe for those who may find this important – and have lived all over this town. But when I was born my folks lived in the North End. My mother grew up in The Bristol Hotel (now a parking lot). Yes, at one time the NorthEnd was where the hippies and rich used to live. There were old homes which often were rentals. It was nice – thanks to Lady Bird Johnson’s Beautification Act those home were saved. People could get low interest loans to repair and update those charming old homes. I loved living in the North End – until a wave of fast driving in the streets became just too popular. So I sold and moved up to a larger (now known as mid century modern) home on the bench not far from where I grew up in a Art Troutner home (a personal friend of my folks). I took a turn and lived in GV for a few years and am now back on The Bench. I find that people up here are just as kind and friendly as the people in the North End were. Not many folks walk up here where I am, but then the neighborhood streets are wide and people drive as if they should have started a half hour ago… especially as they try to escape to get back to their North End home. So enjoy the North End and thank the Democrats for the charm. city mouse – country mouse. Any estimates of how fast and how much Bieter’s Angles will raise county taxes and fees? I’m going to say double everything within two years plus several creative new fees to funnel new county revenues to Team Dave. I’m ashamed of how many people in my rural area fell for this. I’m deeply disappointed in local GOP for wanting to be in 2nd place. None of this violence would happen if the City/County would simply rent them houses in a nice neighborhoods. Why not, the homeless are more important than homeowners after all. And it save money at the jail.